Understanding the student loan process, from application through repayment, is important to your financial success today and in the future. Select the topic you'd like to learn more about. Whether you take out federal or private student loans to supplement other aid, you need to understand how each type of loan you have works to successfully pay it off. Once you enter repayment for your student loans, you need to understand all of the options available to you. Depending on your preference, there are several ways to submit your monthly payments. Review your options and find the best method for you. 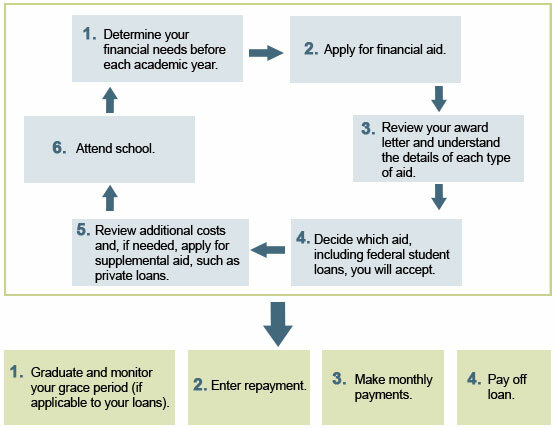 Several plans are also available for repayment of both federal and private student loans, depending on your eligibility. 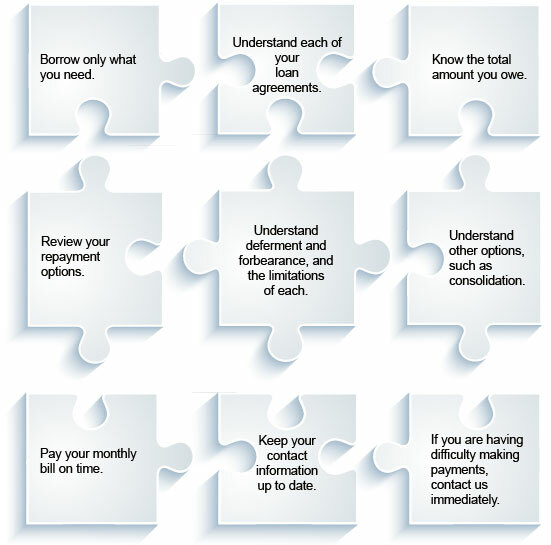 Learn more if you are having trouble making payments under the Standard Repayment Plan. You may also want to look into programs and benefits you may be eligible for, such as loan forgiveness and military benefits. Are planning to enroll in school again. Are in the process of applying for deferment or forbearance. Are not happy with your education. Keeping up on your student loan payments can help you successfully avoid fees, keep payments affordable and safeguard your credit rating. To do this, you should understand the details of your individual student loans and take a proactive approach to staying up to date on information and making payments. Default occurs when you do not make payments on your student loans as scheduled according to the terms of your credit agreement or promissory note. A variety of things could happen if you do not pay, or default on your student loans. We don't want any of our customers to experience the negative effects of default. Contact Aspire Servicing Center to take action as soon as you know you can't make a scheduled payment — assistance options may be available to you. Late payments, missed payments or other defaults on your account may be reflected in your credit report. Becoming ineligible for federal financial aid in the future. Losing the eligibility for loan deferment or forgiveness on the defaulted loan. Having the entire balance on your loan(s) become due immediately. Requiring your employer to withhold money from your paychecks to pay your debt. Withholding of federal or state tax refunds through a tax offset.